Dr. Meek has been in practice for 30 years. 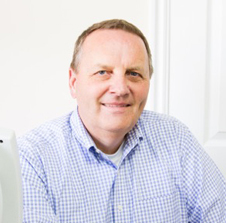 Dr. Meek has spent 25 years working with an ophthalmologist and is highly skilled at diagnosing and treating medical eye conditions. Dr. Meek's interests other than eyecare, include family, good food, movies and sports. Great satisfaction comes from helping patients improve their vision. "May I take this opportunity to thank the many patients who have entrusted me with their eyecare needs throughout the years. It has been my pleasure serving you and I look forward to many more years of eyecare service."